I recently read a post on PBWriter's blog extolling the virtues of Dragon naturally speaking version 8. The last time I tried this piece of software it was at version three or four and the kids and I spent a happy hour confusing it utterly. It reciprocated by confusing us just as much. With faster processors, more ram, more hard disk space, I suppose it was only natural (no pun intended) that the software should have improved over the following five versions. So, armed with almost $200 Australian, I bought a copy from eBay. It arrived today so I plugged in the headset and microphone, installed the software and spent 20 or 30 minutes training it. I'm quite looking forward to writing a short story or a chapter of my next novel in this fashion. One benefit is that you can gaze out the window and dictate without even looking at the screen. One negative is that talking to yourself can be taken as a sign of madness. In summary, I would wholeheartedly recommend this software. I have already caught up with half of my e-mail backlog without laying a finger on the keyboard more than once or twice. I just dictated this entire blog entry and only had to correct two words. Not bad after only 20 minutes training. In case I don't post again before Christmas, have a good one. I'm guessing they've analysed a load of bestsellers and distilled the titles to discover what elements most have in common. For example, titles with a proper name plus one or more nouns (e.g. Harry Potter and [something]) do better than wacky, oddball, too-clever titles which nobody can pronounce. A double or treble meaning is good, as long as the title isn't contorted unduly to make it work. Personally I think the content is more important in making a bestseller - you need word of mouth for that, which means people reading and enjoying the book, not just talking about the title. On the other hand, every little bit helps in this game so why not put your intended title to the test? You can't buy Hal II yet (or even Hal I, if you live outside Australia), so non-writers might be surprised to hear that I'm putting the finishing touches to Hal III, a book which won't be in the shops until September 2006. Sure, my editor will be giving me a list of suggestions to improve things, but the manuscript I'm handing in will be as finished as I can make it on my own. The final deadline for Hal Spacejock III is April 2006, but I've got two SF conventions, a literature festival and the launch of Hal II to contend with at the same time. Anyway, my editor requested the manuscript in time for xmas, which is akin to a general requesting his troops attack the enemy. I haven't mentioned yWriter much on my blog. It's a tool, I use it, and that's that. Today I realised just how much I owe this software, after an incident with my work in progress. The story so far: the draft of Hal Spacejock III is due in next Tuesday. Over the past week I've been scribbling on a printed version, turning the last five chapters into a mess of arrows, underlining and crossing out. I've inserted sentences describing new scenes, added comments explaining what the sentences are for, and then added notes explaining the comments explaining the sentences. So far so good... this is working. Now, some months back I generated a DOC file from my Hal 3 yWriter project because I thought I'd finished the structural stuff. Since then I've done two line editing drafts, which means the original project is outdated and unusable. So, today I tried to perform the edits in the word processor, and within half an hour I felt like I was up to my waist in quicksand and sinking fast. I couldn't get an overview of what I'd changed, what needed doing, what the structure looked like now that I'd moved scenes around, whether the chapters still ended on high points or hooks... nothing. I couldn't find the placemarkers for new scenes I had to write, or the comments I'd written telling me what they should contain. I couldn't link the narrative, quickly check that characters weren't in two places at once... I couldn't function, full stop. Finally, in desperation, I cut the last five chapters from the DOC file and built a new yWriter project. I pasted the chapters into files, automatically split on the scene breaks (* * *) and applied scene descriptions and titles. 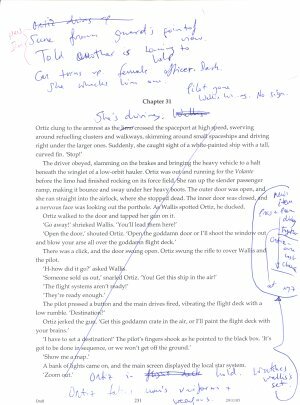 Then I marked scenes as 'outline', 'draft', '1st edit' and so on. I felt myself relaxing as I did this, gradually hauling myself out of the Quicksand of Despair. By 1pm I was ready to write again, and by 4pm I'd knocked off two thousand words and knew exactly what I needed to do to finish the book off. This isn't a commercial for yWriter (it's a free program anyway, and I really don't care if I'm the only person on the planet using it), but I don't understand how other writers can sit down with a big DOC file and come up with a coherent book. I'm an organised person with a decent attention span and a very good memory, but I'm in awe of anyone who can leap about in a huge file and make it work. I realise Word and OO have outlining, but it's never worked for me. Last time I tried every line of dialogue was picked out as a heading, which defeats the purpose of an outline. And you can't drag and drop a scene, and editing comments is clunky, and... Well, they're not yWriter. I just put the corrected galleys for Hal Spacejock Second Course in the mail. Just two minor things, neither of them important. I then spent more time writing a new bio than I did reading the galleys - or at least it seemed that way. I have two characters to remove, and a minor character I'm planning to promote to major (hah). Book two features a strong female character (Sonya Polarov) opposing Hal, and while I don't want book three to be a carbon copy, there IS a minor character (Lieutenant-Colonel Ortiz of the Cathuan military) with a similar role. What can I say? I like writing kick-arse female characters prepared to take charge of their own destiny. I also have a scene where Hal dresses up as a stewardess after Clunk mis-reads a contract. I'm wavering over this one - it's a bit of a farce, and I usually avoid making idiots out of my characters. Problem is, there are two events during the flight which are significant later, so dropping the whole scene isn't an option. Oh well, back to it.